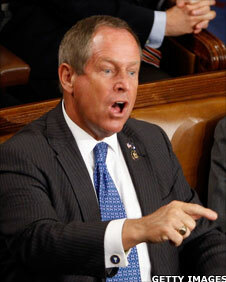 Joe Wilson is best known for yelling ‘you lie’ at President Obama during an address to Congress last year and became a hero to Rush Limbaugh and the Teabagger crowd. I was so honored to serve customers at Wendys in Irmo! How’d you like to have a Congressman serving you up lunch? For some folks at Wendy’s in Irmo, Joe Wilson was the guy manning the drive-thru window, as part of his Joe Means Jobs tour. 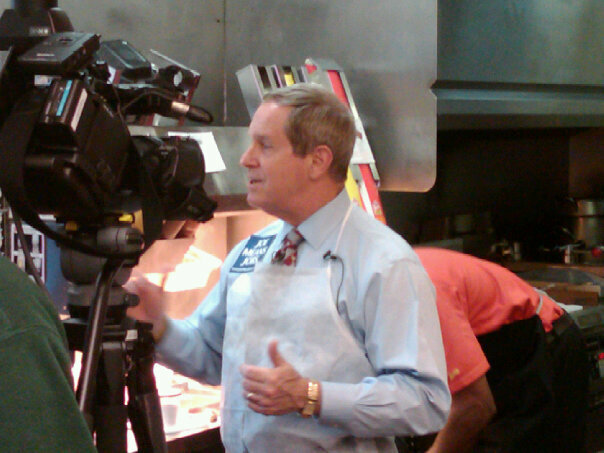 The event that attracted all the TV cameras was Congressman Wilson donning an apron serving up some lunch. Unknowing customers got quite the treat when they pulled up to have Joe serve up their burgers and fries at the drive-up window. The Irmo Wendy’s employs around 11 to 13 workers per shift. Being up close during the busy lunch hour gave Joe a firsthand idea of how hard South Carolinians are working. In case you’re curious, Joe says his favorite item at Wendy’s is the Chili. Even his campaign’s jobs posting admits to the photo op – ‘the event that attracted all the TV cameras …’. Unknowing customers received quite the treat when they saw Joe serving them their food. Seriously, how many Americans would recognize their United States Congressman or Senator on the street? Unless of course, they saw the TV camera and ‘Joe Means Jobs’ on his apron. Lastly, this Joe Means Jobs is all well and good but get real – if the jobs are at Wendy’s, then we’re in some serious trouble. When I was a child, fast food restaurant jobs were filled by high school dropouts in the morning and high school students during the nights and weekends. My first real job was at Burger King and I don’t recall any real adults there except the manager and the assistant manager who left for a brief period to attend BKU (Burger King University) – I’m not making that up. It’s no lie. Joe Wilson serves up fast food. It’s cute but I’m kind of put off by the title because it trivializes the level of the disrespect Wilson showed the President. Republicans were even offended and told Wilson to apologize to POTUS. That is until Rush Limbaugh hailed Wilson as the conquering hero and the martyr because he was pummeled in the media for his offense. From the It’s no lie article. A simple Google search indicates that Wilson is referring only to the Corporate tax rate. Documentation does support that numerous states have higher corporate tax rates than many other countries. What Wilson is ignoring is that the tax rate on individuals in the United States ranks among the lowest worldwide. What this tells me is that Wilson’s priority is to the corporations. 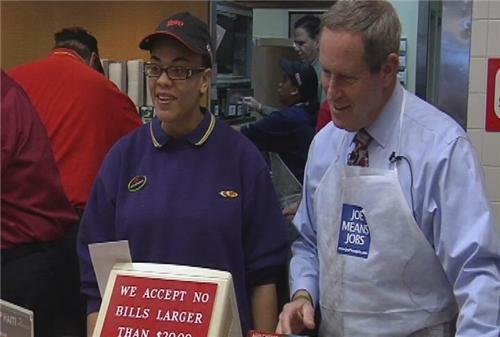 He was honored to serve Wendy’s customers and corporate interests. As far as his Individual constituents – not so much. Lower the Corporate tax rate – More Individual jobs at Wendy’s. This entry was posted in Barack Obama, Democrats, Politics, Republicans, US Congress and tagged Joe Wilson, Tea Party, Teabaggers. Bookmark the permalink.